The apartment is spacious with a large balcony as indicated in the advert. However, the photos do not give an accurate impression of its condition, it really is in need of refurbishment. Had no complaints with the apartment complex which was fine if a bit remote, a good 20 minute walk to the centre/night life. It's only about €5 for a taxi if you prefer not to walk. The sunny balcony does not get the sun until about 1-2 pm. Having said all this we had a very enjoyable holiday with great weather, so overall would recommend. 2. The apartment was advertised as having a separate ex but didn’t!! I wrote to agent to advise of the above and said we didn’t feel we received what we’re entitled to or paid for, and got what I considered to be a very sarcastic response. They have now ceased communicating! Thank you for the review. I am glad you enjoyed the property and you found it clean and well equipped. 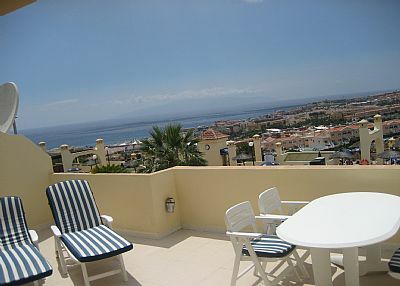 Obviously a big selling point is also the huge sunny terrace with those lovely views too. I would like to address some of your points. People reading this will obviously be aware there are always two sides to a story. Firstly, you were told to make contact with the local rep on arrival as we think it is good for you to make contact with the very person who is in charge of looking after you. You already knew the apartment number, there are sign posts throughout the complex showing where each block of apartments are and there is also a reception area who can help with its location. The apartment is actually not far from reception. So we are confused as to why it meant a "long and exhausting trip around the complex" to find it. Secondly I have no idea what you mean that the apartment was advertised as having a separate "ex".....Thirdly, we left a 2nd set of towels, linen, tea towels etc in the wardrobe for you to use / change whenever you liked. To date and within 2 weeks of your departure we have exchanged 6 x emails. We were investigating your complaint and because we had not been in contact for 2 days apparently we had "ceased communication".....The very day you wrote this review we exchanged 2 x emails! If you refer to your booking contract you will see that the breakage deposit is automatically sent back to your card at 14 days after departure. So again it is confusing that you mention this in a review less than 7 days after your return home. We are also confused that you made contact with our local rep on arrival but then did not phone her once during your stay even though she said she was only a phone call away if you needed to visit.....Unless we hear from you we have to assume you are happy. If not then please call us and we will visit immediately to help. We really do welcome customer feedback and will act on anything constructive that is given to us. 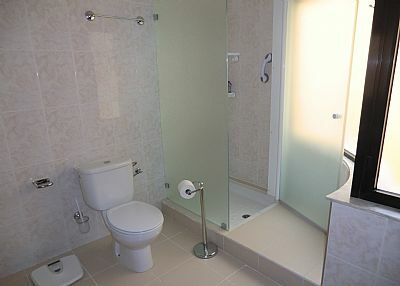 We also clearly want our customers to have the best experience possible in our properties. Good customer service is something we pride ourselves on. As you can see we have received many 4 and 5 star reviews for this apartment and have received very good comments about our helpful staff. We will continue to provide excellent service and hope many people come and enjoy this very nice apartment. We have just returned from a lovely week in this apartment. It is up hill coming back from the town area but we were aware of that when we book. An excellent large supermarket is 5 mins walk away. 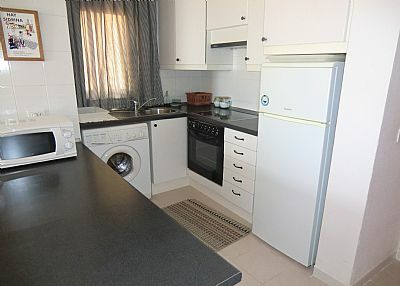 The apartment is as shown in the photographs, the directions and contact with the agent were excellent. Views over the ocean from the balcony were stunning, we spent most of the day on the balcony smiling at the dash for sun beds around the pool. The apartment would benefit from new crockery as some is chipped, but we managed. Thank you for the 5 star review. I will look into / replace and chipped crockery. I am so glad that the apartment continues to get excellent reviews. Hop to see you again in the future. 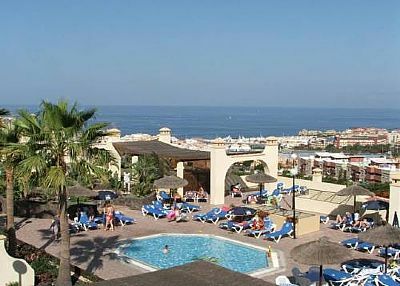 we had very nice views from the balcony over looking the pool and also a sea view. The stairs and lift close by for easy access to the pool and bars. over all we had a very relaxing holiday. only one suggestion would be to have a bottle of water in the fridge. Thank you for the 5 star review. I am so glad that after your delay you found the apartment exactly as required. Thank you for your review. We are so pleased that you enjoyed your stay in the apartment. If you would ever like to return to this or any other apartment please do not hesitate to contact us. 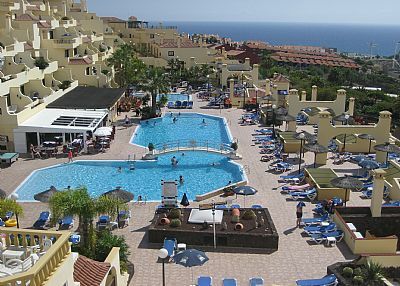 With best wishes from Tenerife Holiday Homes. 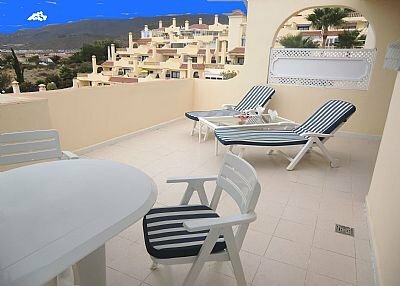 Stayed for a week on the 30th June, apartment was excellent, extra large balcony was a plus, bit out of the way but if you don't mind walking its fine. Great for family's looking for a chill around the pool, feeling the children are safe. Definitely would return. Thank you for your review. We are so pleased that you had a lovely time in the apartment. If you would ever like to book again please do not hesitate to contact us.